Our men followed the Greatest Generation into another bloody war after only five years of peace: the Korean War. Remember it? Nearly as many of us died there as in Vietnam, the Baby Boomers’ war. Our women bridged a culture our mothers had discovered—going to college, but returning home to hang a framed diploma in the family kitchen. We began life expecting to live the same lives until the world changed around us, and many of us chose to change with it. 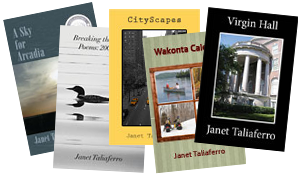 Janet Taliaferro sensitively portrays the lives of four young college women, drawing the reader into a close circle of friendship with those characters. Taliaferro thoughtfully explores the social context that defines and constrains them and the oppositional discourse they develop within that framework as the author delves into the consequences of social policies that continue to occupy space in the political discourse of today. This book could not be more relevant to our time or more enjoyable to read. At heart, Virgin Hall is a book about what the 1950s were like and all the rigid hypocrisy and misplaced priorities of the times. We were the last generation to reflect the mores, habits, attitudes, and cultural values that dominated American life over the previous century. Virgin Hall is also is the story of a kinder era, when the individual felt a duty to society at large, values that seemed to die off after the assassinations of John and Robert Kennedy and Dr. Martin Luther King Jr. in the 1960s. The good went with the bad for those of us living through the profound social changes of the times. I was proud to be a part of the civil rights movement, proud to be active in politics trying to elect progressive leaders, and proud to follow John and Robert Kennedy into what we hoped would be a new era. Martin Luther King Jr. spoke to and for many of us. We had grown up in the days of lynchings, gentlemen’s agreements limiting what Jews could do, and suspicion of Roman Catholics that bordered on hatred. The only choice a woman had with an unwanted pregnancy was a coat hanger or a backroom, illegal abortion. No one mourned the passing of these societal defects. Virgin Hall was inspired by my experiences and the women who lived on the third floor of the freshman dormitory Virginia Hall, at Southern Methodist University in the early 1950s. Naturally the boys called it Virgin Hall. It is important to say this is not a roman à clef. None of these things happened to any of us. I have borrowed certain characteristics and details of background to create a pastiche of characters for the book. Purists of the time will recognize that I have taken liberties with the details of sorority rush and that Virginia Hall did not have suites like the other dorms. Other than that, I have stayed close to the truth of the time. Virgin Hall is a hard-to-put-down read for any woman who spent time on a college campus in the ’50s or ’60s…especially if it was in the South. It was a poignant trip back to my days at SMU, and the descriptions of these four freshman women and the fears, insecurities and issues they faced were right on the mark. I really enjoyed this novel and highly recommended it to my friends from college. Reading Virgin Hall has allowed me to relive my own freshman college days at Syracuse 60 years ago—but now, for the first time, I had a view from a female perspective. Janet Taliaferro’s poignant and delightful remembrance has captured life on and off campus in the fifties so well—the fun, the fears, the sexual awakening, the melding of so many varied backgrounds. I remember it well, along with the years-later reunions and keeping in touch with a few classmates. Thanks, Janet. Janet Taliaferro’s beautifully written book reveals the fantasy of nostalgic longing for “simpler times” by adeptly demonstrating that women’s lives aren’t simple in any time. Gracious living covered up violence, a refusal to recognize women’s reproductive rights carried profound consequences, and social mores dictated racist practices. It is the type of book I would have used when teaching Women’s Studies or Conflict Studies; approachable, entertaining, and sure to generate useful discussions that challenge students to look beneath the surface of our social myths. I appreciated the raw honesty of Taliaferro’s characters; it was a pleasure to meet them and I highly recommend that you make their acquaintance. It’s truly a pleasure to count such powerful storyteller among our web presence clients.